Hammersmith to Wood Lane service. The crossover west of Paddington is not yet commissioned, and will not be until ATC is in place. The crossover west of Royal Oak remains, but has not been used for over ten years. It is hand worked and requires a number of staff to do so safely and in accordance with current procedures. The single line working to Ladbroke Grove would require yet more staff - something that will be difficult as is already proving in resourcing the single line (locked in) service. Primarily the reason is one of protection. In order to maintain the safety of the single line, the traction current section Paddington (Sub)-Royal Oak westbound has remained switched off, meaning no trains could reach the locked in section. There are no appropriate section switches that could be opened to maintain this integrity. Signal OP11 is also maintained at danger by Edgware Road cabin, and again there are no other suitable, semi-automatic signals in this area. It is easy enough to get from Edgware Road to Paddington (and beyond) by local buses or the Bakerloo, Outer Rail Circle and District lines. I think you mean OP12 otherwise there would be no trains to High St and beyond. Information I have shows a switch at Ladbroke Grove so the cross over at Royal Oak could be used but as you say it's not been used for 10 years so there is no one trained to operate and you would only need those with the required license. Why is it that the doors of the front and rear cars do not open during this shuttle operation other than at Hammersmith (at least on the Eastbound wrong direction working, as those are the only journeys I have made so far)? I thought that as long as the train was berthed in the right spot of the platform, the door operation would be unaffected no matter the direction of travel? Assuming it's a little more complex than that...!? It is more complex than that, the equipment that provides CSDE (Correct Side Door Enable) and SDO (Selective Door Operation) information is only installed for the right direction. Or rather, it's installed for fully signalled movements. So at a platform like Edgware Road platform 3, where trains can arrive from both directions, the equipment is installed at both ends to allow for this. Obviously on the eastbound at Shepherd's Bush Market, trains generally only arrive in one direction, so the equipment is only at one end. As a result the CSDE override procedure needs to be carried out. 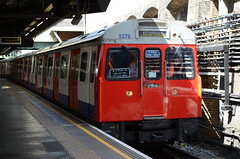 Now, as we know, the S stock is quite a lot longer than some of the platforms it stops at, so to get around that, ordinarily we have Selective Door Operation (SDO), where 1-3 doors in the front and/or rear carriages may be inhibited from opening if they are not alongside the platform when the train is stopped in the correct position. As such, only doors which are alongside the platform can open, and there's no danger of anyone ending up on the tracks. The information for SDO is provided by trackside equipment which is, like I say, only installed at the end that it would be needed at in normal circumstances. In some select locations this is both ends, but usually it's only one. Because of this, when the CSDE override procedure needs to be used, the train doesn't know where it is and it doesn't know which doors it is safe to open, so it has to assume a worst case scenario and cut out all the doors in the front and rear cars, and then there's no chance of any doors opening where it wouldn't be safe for them to open. Note that this isn't just for wrong direction moves. If you overshoot the normal stopping mark you may end up out of range of the equipment and you'll need to use the override procedure. Again the front and rear doors will be cut out, even if all of your doors are actually alongside a platform, because the train doesn't know which doors it is safe to open because it's out of range of the equipment. I should add, at Hammersmith, you actually do arrive in the right direction at the right end of the platform, so all the equipment is there and that's why the doors can be opened normally. The doors operate normally in the normal direction, it's only in the wrong direction doors need to be cut out. A very thorough and informative explanation there! Thank you. I know there's always a good reason for these things, it's just always good to understand the why! Because of this, when the CSDE override procedure needs to be used, the train doesn't know where it is and it doesn't know which doors it is safe to open, so it has to assume a worst case scenario and If you overshoot the normal stopping mark you may end up out of range of the equipment and you'll need to use the override procedure. Again the front and rear doors will be cut out, even if all of your doors are actually alongside a platform, because the train doesn't know which doors it is safe to open because it's out of range of the equipment. Just to add a small point to tut's excellent appraisal, under the circumstance that the train remains in a braking position - not going into 'off and release', while decelerating to a stop, then the rear doors will open normally as they will be detected as fully in the platform. A tangential question: is there a good reason why they aren't reversing the trains on the other end of the H&C at Paddington rather than Edgware Road? It would be much more useful to the customers. And I believe there's a crossover west of Paddington they could use. I was at Paddington on Wednesday morning and noticed that due to the H&C closure plus District Line problems the only subsurface trains serving this station were the Circles. As a result whilst waiting for my mainline train (at 8:21!) I heard frequent announcements about overcrowded platforms were causing the Underground station to be closed. Not disagreeing with the difficulty of using the Royal Oak crossover, but it has been used in the last decade. I travelled over it on 9th October 2011, during engineering work in the Paddington area. I can remember the member of staff operating the points, I think that there was also a pilot man needed, as the move isn't (fully) signalled. The move is not signalled and the points are hand worked. 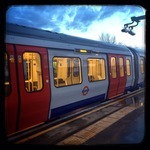 Circle Line has tweeted to say that trains are now running again. Initially suspended Hammersmith-Edgware Rd, then from 0830 changed to suspended Hammersmith-Ladbroke Grove. As there is no crossover at Ladbroke Grove, are trains running empty between Hammersmith to Ladbroke Grove ? Looks like it's fully open now. trains were actually running the usual Sunday timetable from start-of-traffic but running empty, initially Hammersmith-Edgware Rd, then from 0830 changed to Hammersmith-Ladbroke Grove (some trains from Barking were displaying "Royal Oak") then from 0900 passenger services were restored.